Schluter®-DECO provides decorative lines within tile coverings and edge protection at transitions from tile coverings to other same-height surface coverings, such as wood or carpet. 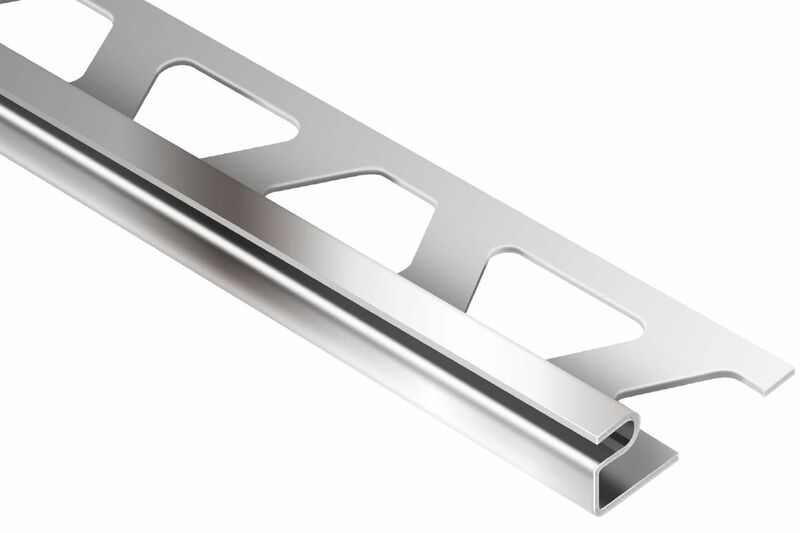 The profile is available in stainless steel, solid brass, chrome-plated solid brass, and anodized aluminum. DECO features a trapezoid-perforated anchoring leg, which is secured in the mortar bond coat beneath the tile, and a 1/4"" (6 mm)-wide visible surface that meets the high aesthetic requirements of showrooms, lobbies, galleries, exhibition booths, etc. The anchoring leg of DECO, in solid brass, chrome-plated solid brass, and anodized aluminum, is available with a special radius perforation “R” so that the profile can be used to form curves. 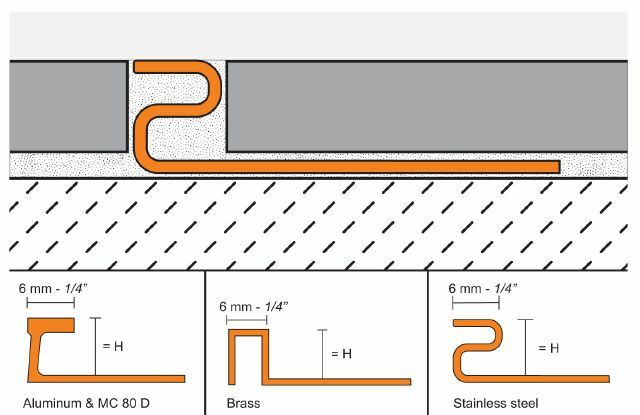 DECO in chrome-plated brass requires a relatively large bending radius. 5. 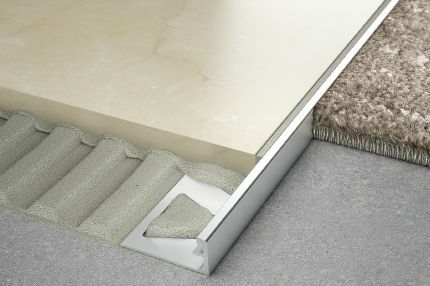 Solidly embed the tiles so that the tiled surface is flush with the top of the profile; the profile should not be higher than the tiled surface, but rather up to approx. 1/32"" (1 mm) lower. 6. 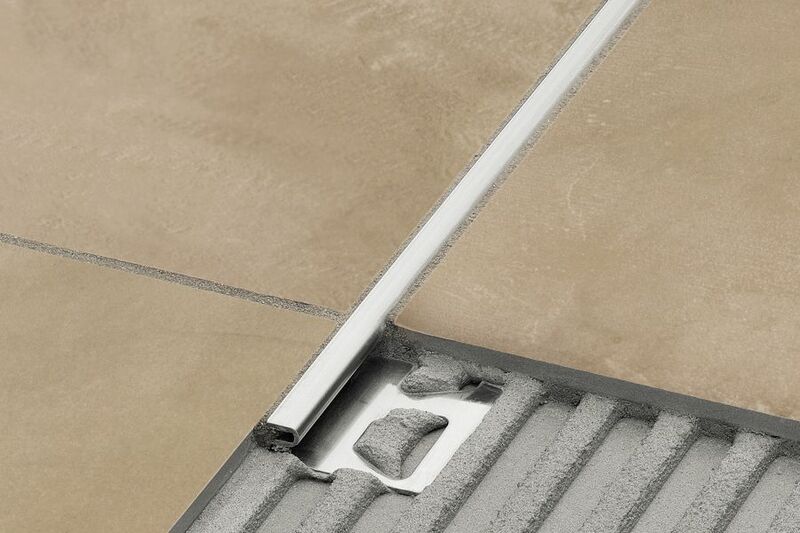 Leave a space of approximately 1/16" - 1/8" (1.5 - 3 mm) between the profile and tile. 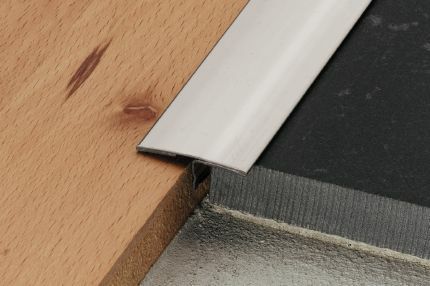 The Schluter®-DECO profile requires no special maintenance or care and is resistant to mold and fungi. Clean profiles using common household cleaning agents. Stainless steel surfaces exposed to the environment or aggressive substances should be cleaned periodically using a mild household cleaner. Regular cleaning maintains the neat appearance of stainless steel and reduces the risk of corrosion. All cleaning agents must be free of hydrochloric and hydrofluoric acid and chlorides. Stainless steel surfaces develop a sheen when treated with a chrome-polishing agent. Oxidation films on exposed solid brass or aluminum can be removed by using a conventional polishing agent, but will form again. In the case of anodized aluminum and chrome-plated solid brass, do not use abrasive cleaning agents.